Going to see an opera for the first time is a bit scary. It's just a bunch of fat blokes and warbly maidens singing in tuneless Italian before melodramatically kicking the bucket, isn't it? Who would want to see that? But Raymond Gubby's lavish production of Carmen at the Royal Albert Hall might be the one to change your mind. For starters it's in English, meaning you have a chance of actually understanding the plot. And it has acrobats, fire-eaters and a cast of seemingly hundreds of children and soldiers. Did we mention it was lavish? The story itself is as old as the hills. Girl meets boy; girl is a bit mad and gets boy sent to prison; boy become obsessed with girl; girl falls for a bull-fighter instead, etc. Pretty much the contents of an average episode of EastEnders, in fact. Cristina Nassif's Carmen is a feisty, tempestuous character who holds both the male characters and the audience in her spell, while John Daszak's Don Jose is a suitably jealous loser. The inventive staging in the round allows what is usually the stalls to become a village square or a desolate forest, even if the curvy split-level stage looks a bit like a drained swimming pool thanks to the ladders round its edge. Best of all is Bizet's sumptuous music which is crammed full of 'Greatest Classical Album in the World... Ever' type hits. Played effortlessly here by the Royal Philharmonic under the direction of Peter Robinson it's stuff to get your pulse racing, from the instantly recognisable overture to the endlessly hummable Toreadors Aria. This is populist opera and all the better for it - anyone who enjoys a dramatic spectacle, some decent tunes and a bit of Spanish buzz will find plenty to appreciate here. 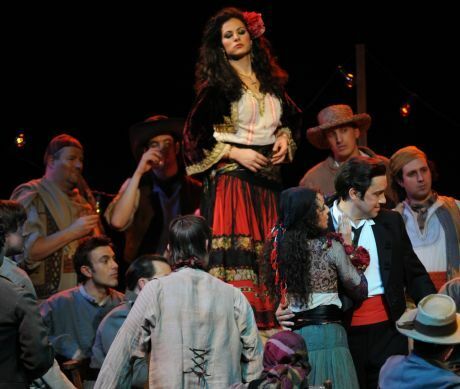 Carmen at the Royal Albert Hall runs to Sunday 8 March with tickets from £21.